to families who like a lively environment and if you want, it's easy to socialize with other guests. The Cala di Lepre, part of the Hotel Chain Delphina Hotels & Resorts, is located in the enchanting site of Capo d’Orso, almost in front of the National Marine Park of the Archipelago of La Maddalena, at the limits of Costa Smeralda, 3 km far from Palau, 39 km far from Olbia. It is set on a hillside immersed in Mediterranean maquis and whose main inhabitants are little wild animals such as tortoises, hedgehogs, weasels, red partridges, turtle-doves and hares, etc.. The Cala di Lepre is a perfect choice for nature lovers and guests who love walks on the countryside or any excursions by horse or bike. Small bays and promontories do colour the scenery, changing between sea, hills and rocks sculptured – over the years by the wind – a good example is the “Bear Rock” (Roccia dell'Orso), just a short walk away. 170 rooms and suites, with independent entrance and equipped terrace, all situated on the ground floor in two diffrent zones. 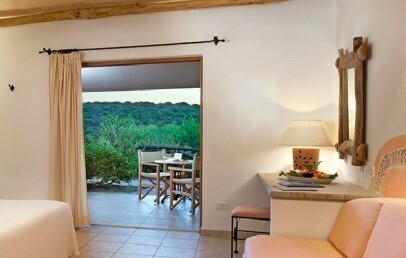 “Parco Rooms” are situated in a particularly quiet area, rich in vegetation, perfect for nature and relax lovers (approx. 400-600 m from the sea). Breakfast served at the close restaurant “Le Terrazze”. “Golfo Rooms” are situated closer to the main part of the hotel and approx. 200-400 m from the sea. Breakfast served at the main restaurant “Arcipelago”. All the rooms have a terrace with 2 deckchairs (or 2 chairs + table), shower, air condition, TV with satellite channels, hairdryer, minibar, safety box and beach towels. The Suites and Senior Suites have moreover a patio on the backside with table and chairs, 2 TVs and 2 air conditioners, one in each room. The beach and sea is approx. 70 m away from the swimming pool area and 200-600 m from the rooms. The beach is public, umbrellas and sunbeds are available against payment. Price for one beach umbrella and two sunbeds: € 20,00 first row; € 15,00 second row; € 10,00 third row (full day). Sunbeds by the swimming pool and a wooden sun terrace by the sea are available free of charge. The sun terrace around the seawater-pool with a small adjacent pool for children is equipped and only a few steps from the beach away. The Wellness Centre “d’Ea Marina Spa” offers thalasso-therapy in harmony with the surrounding nature and the perfumes of the flowers and the junipers. A place where you can relax and regenerate with relaxing and reinvigorating treatments, it is equipped with multifunctional cold and heated sea water pools for thalasso circuits and special water gym exercises, Turkish bath, sauna, fitness centre, relaxation room, elegant cabins equipped for specific beauty and relaxation treatments, gazebo for open air massages. Access to the wellness centre: € 25,00 per person (half day): free use of the pools, Jacuzzi, Turkish bath, sauna, gym and relax area. PS: An self-certification of "good health" is required to complete on-site, before attending any kind of treatments and for use all facilities. Packages for pregnant ladies exclude some kind of treatments. The access is not allowe to guests under 18 years old; guests from 14 years on are allowed if they enter with a parent or have a written permission signed by them. Upon booking you may request to our booking assistants further information about all the available packages at “d’Ea Marina Spa”, it will be our pleasure to advice and book for you the best treatment that will complete your wellness holiday package. The Spa is open 6 days a week during the afternoon. Free assistance to children from 3 to 14,99 years from 20-05 to 14-09, 7 days a week from 9.30 am to 11 pm, excluding the sport activities on Saturday. Upon reservation it is possible to have lunch and dinner with the staff of the animation in a reserved area of the restaurant (with supplement for children on half board basis). A large play area is available for youngest children and an equipped nursery is available 24 hours a day. Several sport activities are available for the older children (tennis, beach volley, soccer, arch and dance), further more they have the opportunity of getting free riding lessons (age between 8-14) in the hotel horse riding school with a minimum of 3 partecipants. Delphina Hotels & Resort is renowned in Sardinia for its high-quality restaurants and Cala di Lepre Park Hotel & Spa follows this tradition, offering a genuine and tasty cuisine and 2 different alternative choices: L’Arcipelago the main restaurant with view on the Gulf of Saline and Le Terrazze a panoramic restaurant, for dinner with candlelight setting (with supplement). Breakfast for guests staying in the “Parco” area is the restaurant Le Terrazze from 07.30 to 10.30 am available – for guests staying at the “Golfo” area is the main restaurant L’Arcipelago available from 07.30 to 10.30 am. In the main restaurant the Brunch Mediterraneo® from 13.00 to 14.30 is opened for a light lunch (€ 26,00 p.p.) without giving up the pleasure of a good cuisine: a buffet of hot pasta dishes, delicious cold dishes based on cereals, legumes and vegetables, salads, fruits and local cheeses. The traditional second courses of meat and fish and sweets are not served at this buffet. Or as an alternative grill dishes, rich salads, sandwiches and ice creams at the pool bar. Dinner (19.30-21.30 in low season; 19.30-22.00 in high season) – a rich buffet of Mediterranean cuisine on the terrace of the main restaurant L’Arcipelago – theme menus with table service on the panoramic and romantic terrace of the restaurant Le Terrazze (on reservation, with a supplement of € 10 p.p.). Furthermore, you will have the chance to take advantage of the Brunch Around, in some others Delphina Group Hotels (details and prices on request). Upon request, at the moment of the reservation, personalized gluten-free menus. The Snack bar with grill with covered ample veranda is nearby. Private parking of the hotel (unattended). Reception open 24 hours. After dinner live music, amphitheater with entertainment for children and occasionally evening shows. Beach volleyball field, 2 tennis courts, archery, soccer field on synthetic grass. Paying services: kayak and playroom; plus the following external services: diving, sailing, horseback riding, excursions. The Wi-Fi connection is complimentary available at the reception, pool area and around the restaurant "Le Terrazze". A shuttle service is available for transfers within the resort. Double room located in the park area, a particularly quiet space, rich in vegetation and 400/600 m from sea. There is a build–in sofa-bed, ideal for a child. 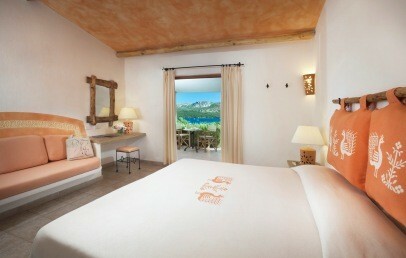 The rooms style is simple and many details recalled the Sardinian culture. The bathroom has a shower and hairdryer. The Parco Standard rooms have an independent entrance and a garden view veranda equipped with 2 deck chairs or 2 chairs and table. Double room located in the park area, a particularly quiet space, rich in vegetation and 400/600 m from sea. There is a build–in sofa-bed, ideal for a child. 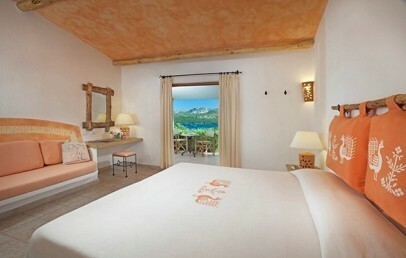 The rooms style is simple and many details recalled the Sardinian culture. The bathroom has a shower and hairdryer. The Parco Standard rooms have an independent entrance and a sea view veranda equipped with 2 deck chairs or 2 chairs and table. Double room located in the Golfo area, closer to the main part of the Hotel and to the services, 200-400 metres from the sea. There is a build–in sofa-bed, ideal for a child. 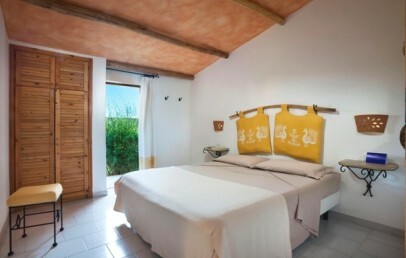 The rooms style is simple and many details recalled the Sardinian culture. The bathroom has a shower and hairdryer. 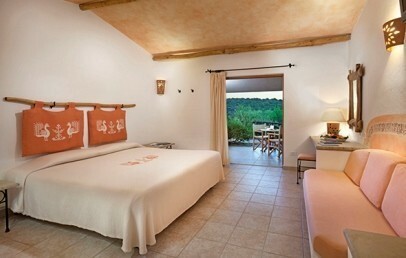 The Golfo Standard rooms have an independent entrance and a garden view veranda equipped with 2 deck chairs. 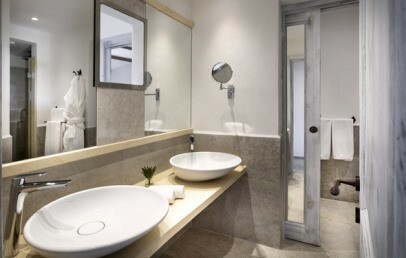 Double room located in the Golfo area, closer to the main part of the hotel and to the services, 200-400 m from the sea. There is a build–in sofa-bed, ideal for a child. 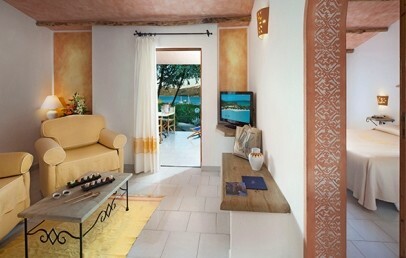 The rooms style is simple and many details recalled the Sardinian culture. The bathroom has a shower and hairdryer. 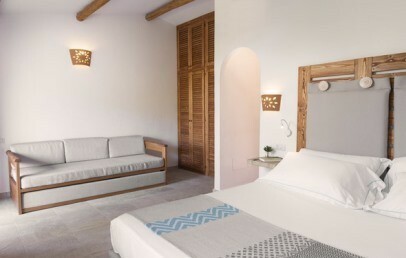 The Golfo Standard rooms have an independent entrance and a sea view veranda equipped with 2 deck chairs. 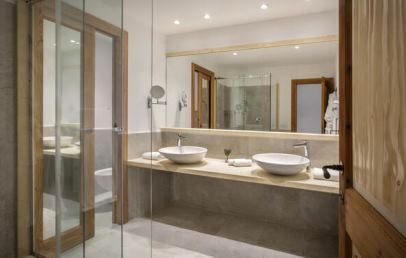 Large Suite located in the Golfo area, closer to the main part of the Hotel and to the services, 200-400 m from the sea. It consists of a living room equipped with two armchair foldout beds. 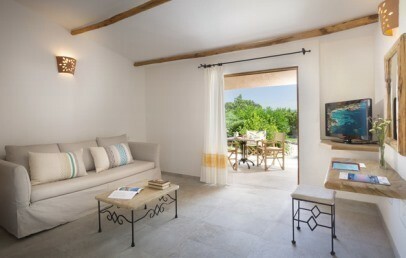 The rooms style is simple and many details recalled the Sardinian culture. The bathroom has a shower and hairdryer. The Golfo Suites have an independent entrance, a patio on the back side and a sea view veranda equipped with 2 deck chairs or 2 chairs and table. 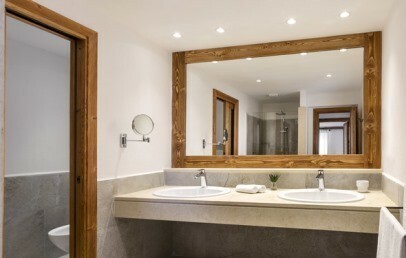 Prestigious Suite with two bathrooms, two bedrooms and a separate living room with a pull out sofa bed (up to 6 adults). 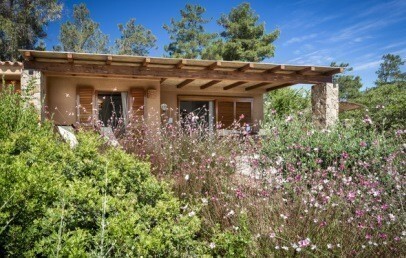 Located in the park area, a particularly quiet space, rich in vegetation and 400/600 m from sea. 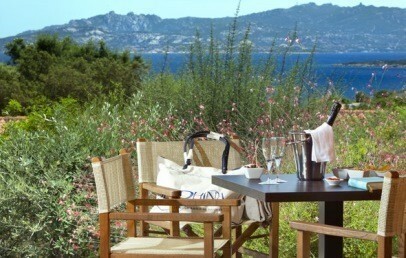 Small equipped sea view veranda with table and chairs. In addition to the veranda the Senior Suites Deluxe also have a rear patio, 2 TVs and 2 air conditioners for the maximum in comfort. Newly renovated elegant Suite with a spacious double bedroom and a separate living room with a pull out sofa bed. Maximum occupancy of four adults. There is also the option of a cot as a fifth bed on request. 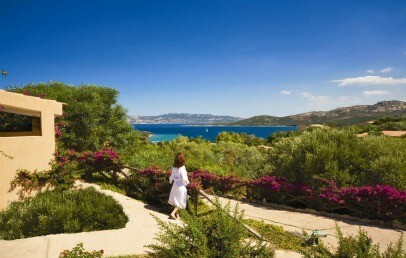 It is located in the Parco area, a particularly quiet space, rich in vegetation and 400/600 m from sea. Veranda with table and chairs. Newly renovated elegant room located in the park area, a particularly quiet space, rich in vegetation and 400/600 m from sea. Equipped veranda and beach towels.